A digital transformation can take different forms. When expanding your company business model to e-commerce, why not make a business acquisition in your industry? This is a simple idea,—buying an e-commerce—but first let’s talk about due diligence. In this article, rather than simply learning about the specific way to perform a due diligence, you will learn about its digital aspect. What’s the goal of this acquisition? First, you need to ask yourself some questions about the seller’s strategy with this acquisition. What is the scale? What will happen next? It is necessary to find answers to these questions in order to focus your attention on the right diagnostic variables. Do you need an ecosystem? A client database? A name, a reputation? We recommend starting with the whole ecosystem modeling, to learn about marketing assets, sales channels or operations, and logistics; you need to understand how these systems interact and connect. This modeling needs to highlight any existing initiative around e-commerce, such as a client database or a marketing automatization mechanism. At this stage, another interesting analysis for an online company is to really learn about its business model. To do so, Osterwalder and Pigneur’s business model canvas can be useful to create a more standard and specific work environment. 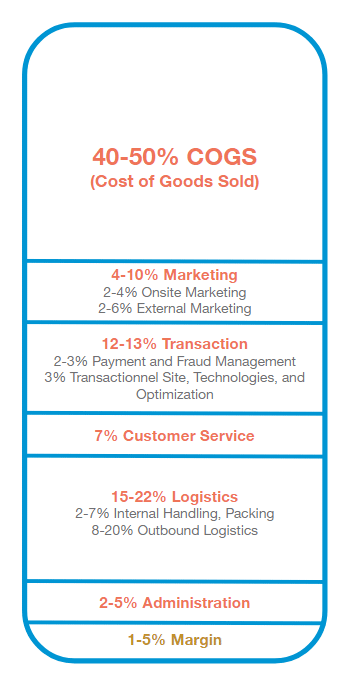 Satisfied omni-channel clients and an increase in client value. Grasping the current revenue (from last year for example) is one thing, but more important is how it will grow over time. This analysis always depends on the company’s history, but going back further might help you understand tendencies with more of more data. Then, you need to have a full picture of the brand growth within its industry. Here, different sources can help you: eMarketer (and other media) often share a growth index for retailers in Canada and the rest of the world. This tool allows you to cross-reference the industry data with your own, to figure out the growth significance. Internet retailers can also provide more precise insight into your industry. With this information, the next step is to learn about the basis of e-commerce: orders, products, clients, and organization. They are the foundation of your due diligence. The enemy of tomorrow’s revenue is today’s revenue. How many SKUs does the catalogue have? How many products were sold last year? How is the catalogue being managed? (by hand or by a Product Information Management (PIM))? What is the product repartition per average value? Which products generate more revenue? Beyond products, when the catalogue allows you to, conduct the same analysis with brands or product categories. Next, client analysis. Are socio-demographic profiles available to study the LTV ratio? What is the traffic audience made of? Where are the traffic sources? Is there a CRM and what data can you extract from it about clients? Behaviour: how many visits per page, and what are the bounce and exit rates? Internal research: were there internal researches? What were their results? Is the conversion rate proportional? Engagement: what is the ratio between new and returning visitors? Loyalty: what is the current mechanism to guarantee client loyalty? Organization is key. What are the current digital resources in place (profiles, skills, roles, responsibility, etc.)? There is always room for improvement in any company culture, especially for your future team’s soft skills development, if it applies. In this regard, you should focus on internal processes, such as the management of ordering and inventory, to single out activities with no added value. We also advise you to analyse technology resources, in order to assess current forces, and also to survey them. Best-of-breed solutions usually simplify integration, but keep in mind that acquisitions should not be based on technology, since technologies can quickly become obsolete. A cost analysis should have a few goals: for each dollar spent on digital technologies, what are the costs for COGS, market entries, transactions, customer services, logistics, or administrative expenses? All of this will inform your understanding of the margin and the biggest expenses. A simple proportional mapping can give you insight into costs. With e-commerce, be thorough with returns and retroactive billing costs. In the end, you’ll need to figure out if the costs fall within industry standards and if investments are rightly made. All of these findings will help you draw conclusions leading to an executive recommendation and ultimately, an informed decision. Executive recommendations are usually rare and need to be actionable tactics for the short, mid, and long term. While doing so, keep in mind our first step: the acquisition strategy. Possessing digital assets might be amazing, but if they don’t fit the strategy, the success of your project will depend on making the right choice. If you fear this data could be hard to collect, Google Analytics can come in handy to answer all your questions (when properly configured). If you don’t have access to this tool, you might want to reconsider your decision. Either way, let us help you! Charles Delannoy holds a bachelor's and master's degree in information technology (IT) and has been evolving in e-business and business intelligence for over 10 years. His experience on major transformation projects makes him an outstanding consultant for actual and future companies.